Today is IWSG Day. IWSG stands for Insecure Writers Support Group and was founded by Alex J. Cavanaugh. 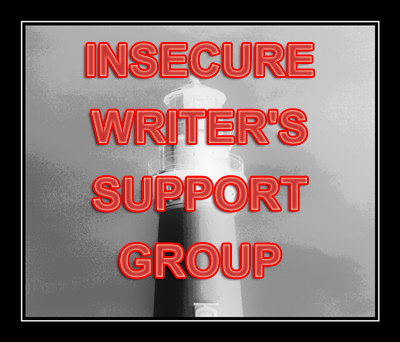 You can follow other IWSG members here or on twitter using the hashtag #IWSG. We also have a Facebook page. I’m so “out of the habit” of blogging that it sure seems to come around fast. I put way too many other things first. Today, I worked on my taxes: listed my professional dues, my expenses and then my income. What an eye-opener. When my income doesn’t (at least) equal my professional dues, I think there’s a problem. And my expenses doubled in 2015. Why? Because I went crazy-wild purchasing how-to books, taking courses and joining groups that promised to mentor and encourage me. I attended a couple of conferences too; I’d be a groupie for about two cents. Seriously, I have “groupie” in my blood. While listing my expenses, I couldn’t help but think of one of my favorite creative writing teachers, Chuck Taylor, founder of Slough Press and a professor at Texas A&M University. I knew Chuck many years ago and once we had poems published in the same literary journal, Cedar Rock. Anyway, Dr. Charles B. “Chuck” Taylor told me, when I wanted to sign up for yet another one of his classes that I needed to quit taking classes and write. I think I’ve told you that before but it’s worthy of repeating. That’s good advice for all of us. Well, Chuck … obviously I didn’t listen to you! Doing my taxes made me analyze my problem and there’s only one answer to what it is. No, it’s not laziness. It’s FEAR. I need those classes and how-to books because … What if I can’t write? Well, deep down, I know I can but what if I can’t write well enough? There’s the rub. What’s well enough? With publishing the way it is–open to everyone now–writing is so subjective. But isn’t that a good thing? Yes, it is, and I recognize I can write better than some and not as well as others, but I don’t want to look like an idiot! The lesson I learned while looking at my pages of expenses is that I have more confidence in writing for FREE—that way, if you don’t like it, think it’s crummy, you really won’t feel cheated since you didn’t have to pay. Stupid, huh? I have two published books, written for magazines and newspapers for about 40 years, judged writing contests, owned a literary magazine, mentored and coached others and here I am acting like a baby. I really think it’s all those “angry voices” out there scaring me. Maybe I just need therapy! Last year, I told hubby I wasn’t going to darken the doors of our CPA friend until I wasn’t embarrassed to face him. Sorry, Doug, won’t be seeing you this year! I’m making a promise to myself: this is my last year to write for FREE. (Have to fulfill obligations.) I know we all like that word, who doesn’t enjoy FREE things, but if we don’t value ourselves and our talents, who’s gonna? Right? Nothing really puts me in my place like figuring my taxes. Do you ever doubt you’re good enough, listen to the voice of defeat ringing in your ears? Or do you just forge ahead whistling your happy tune? Share with us! I SO relate to this post! In my youth, I was a “self-improvement junkie,” running off from workshop to workshop. I could emote with the best of ’em…what I couldn’t do was real life. One day I made a list of everything I wanted to do in my life and started doing those things instead of going to workshops. That’s when I discovered how fearful I was. As a writer, I do take time to study my craft, but in smaller doses. Writing daily and reading the novels of others is the best way to learn and improve. Right now I’m reading a few craft books, mainly because I’ve recognized an area of my writing that could use further improvement…but I read maybe a handful a year. I try to go to one conference a year, but mainly to spend time around other writers. As for feeling good enough, that hasn’t happened yet, but I forge ahead anyway! Excellent article. I’m going to share this one. My friend and I were discussing this yesterday. She has her own business as a publicist and helps create website content. She said she was sending out invoices and had guilty feelings, then the words of her dad came back to her, “If you’re afraid of making money, you’re in the wrong business.” We need to value ourselves and our work, just like any man would. My cousin and I were asked to provide music for a women’s retreat. She started to feel guilty about asking for money. I asked her, “What would a man say?” She stopped and said, “Here’s my fee.” Exactly. I think women, especially, were trained to volunteer, to give away our time and talents for free. As writers, we have a skill that many don’t have, but is greatly needed. Would a company not pay their light bill? Would they try to get the plumber to volunteer his time? Be strong. You’re a great writer. Go. Create. Inspire! I ‘ve reached a point where I don’t want to read or hear another thing about how to write. Makes me paranoid. Now that I’ve studied it for years (because you told me to; thank you! ), I’ve found that my “educated” intuition is just fine. So is yours. Let yourself go and just write. Give yourself permission to return to the *joy* of writing instead of the *discipline* of writing. Awww, Linda, you can lecture me any time! I agree we do have “educated” intuition. Everything we’ve learned about writing is down there somewhere–deep inside us–and it makes an appearance when we immerse ourselves in our stories. And I know what you mean about paranoid! 🙂 It happens to me too! I have a very friendly tax guy, but I hate having to answer him when he asks “you didn’t make even $1 from publishing this year?” This year will be my first with a published book, so NEXT year I’ll be able to show I’ve brought in income from writing! However, the cost of conferences will likely overshadow that until I get going with multiple books bringing in money. This is why I Day Job. But I agree, we should not aim to work for free, especially if we are publishing. I’ve consindered my conferences and workshops as an investment so far. I choose what is of best value for me. I started out with free writing books from the library and a free writers group. As I grew, I joined professional organizations and paid conferences. They aren’t a waste, but certainly we can overdo it! I let my readers tell me how to improve. And I let publishers decide if my work is worthy. You see it doesn’t matter if I’m the best writer in the world. What is important to me is I can and do write. I love it and will never stop. Everything else is icing. Thanks Anna! You’re one of those “whistle a happy tune” folks! Thanks Ellen! 🙂 Reflection is always a good thing. Taxes, not so much. I had a similar experience a few years ago. I was spending too much money on conferences and lectures and coaches, but not making any money. I made a promise to myself that I wasn’t going to spend another penny until I was making pennies. Thanks Elizabeth. I’ve got things I need to edit and get on Amazon so I’m making that rule too! Trying the Indie route. I couldn’t possibly make LESS money by going Indie! 🙂 Hopefully, pennies will fly in my direction!